Who wants to talk about precision? 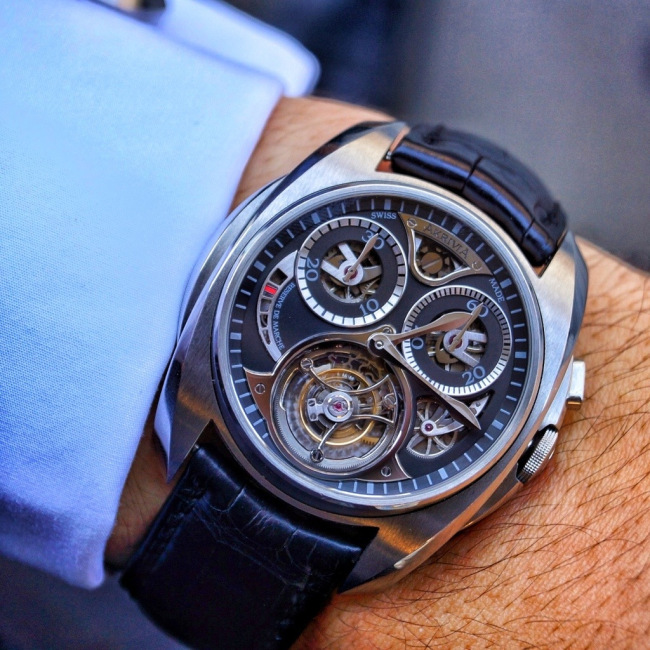 Because that is our today’s main topic – with the name of still not very famous new brand on the market ‘Akrivia’ that in ancient Greek indeed means accuracy or precision I will make a full hands-on review of their first creation – the tourbillon/chronograph. 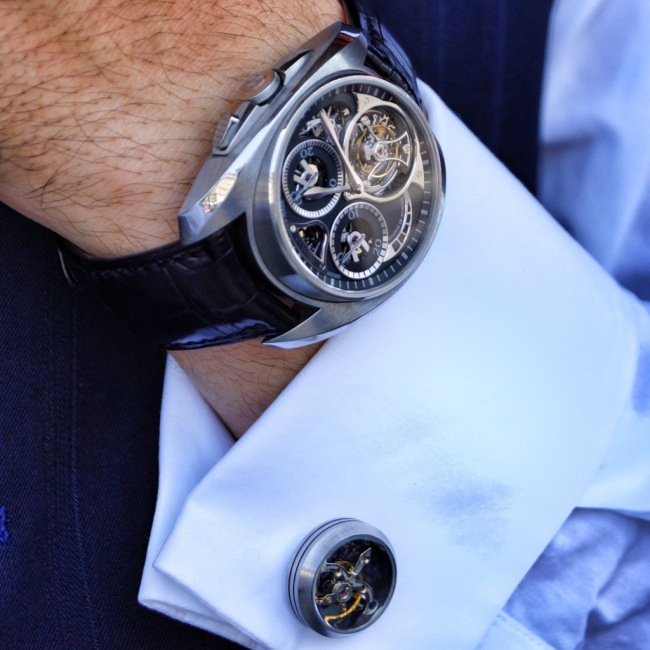 For some of you, who may have read my article on tourbillons here you already know that this movement complication can slightly increase the time accuracy of the timepiece, though not as effective as on a pocket watch. And as AkriviA suggest precision right from the name to keep up with it the brand’s first watch already explores that idea by bringing together 2 traditional complications: tourbillon and chronograph, both aimed to make the time precise. 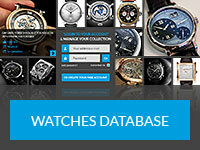 I know that today in the watch world there are many new entrants on the market, many new watches and it is sometimes hard to understand what is worthy taking a look at and what’s not. 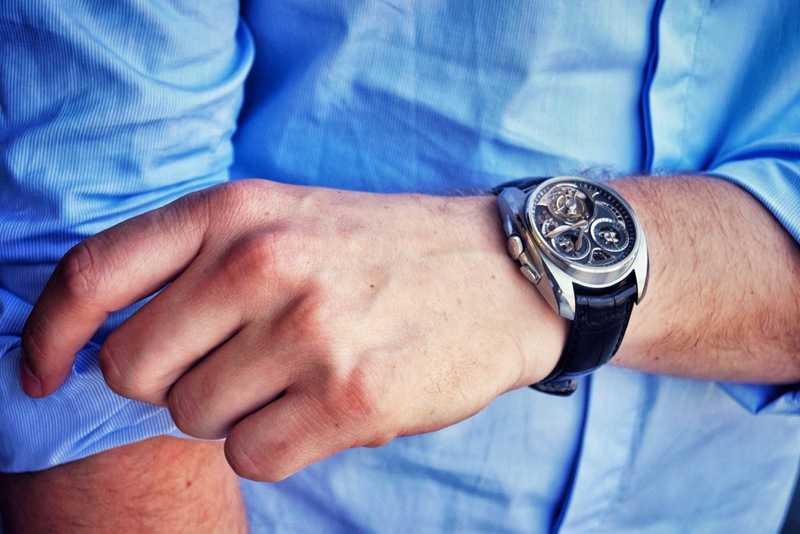 My gut feeling told me that this watch is definitely something interesting and I decided to take a closer look at it in person, meeting with the creators of the brand, who have started it – Rexhep and Etienne, two guys behind AkriviA both have very intense horology background for such young entrepreneurs. 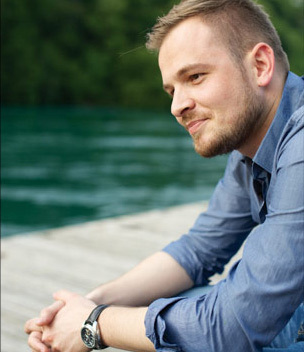 Rexhep Rexhepi is the main brain behind it; he spent 4 years working and studying watchmaking at nonetheless than Patek Philippe, brand known for technical perfection, and huge history behind it. 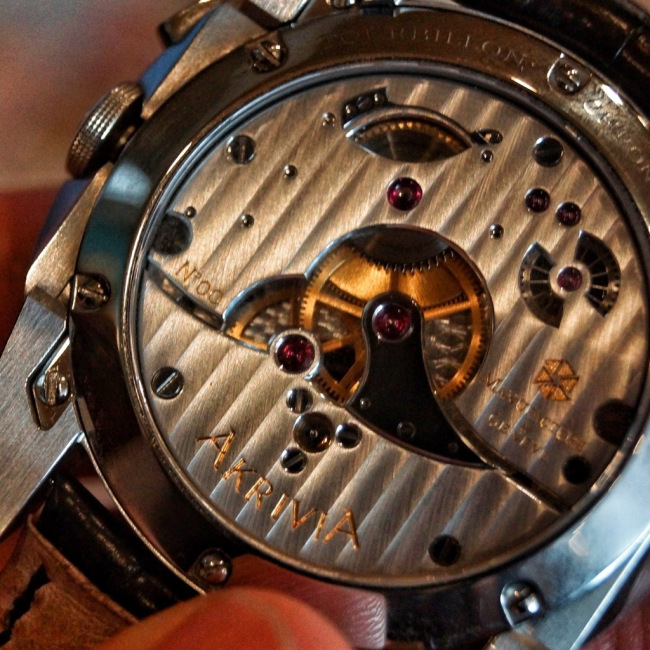 Apart from working there Rexhep also has collaborated and helped such famous watchmakers like Francois Paul Journe with some of the pieces, and has definitely learnt from the best, judging by the outcome of the new AkriviA piece. 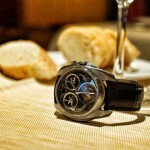 Etienne has also helped AkriviA start and create the first watch, using his years at Chopard. 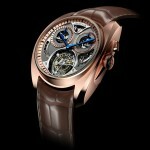 Now a little bit more about the Akrivia Tourbillon Monopusher Chronograph – the roots and inspiration for the piece came from the classical and traditional round casings, that were popular throughout the entire horology history, but with AkriviA it is not just that – the case is made out of 30 different metal parts, combined together to create a very futuristic yet classy design. Combining the matte looking finishing, very modern dial and a traditional strap top this feeling. The mix surprisingly works very well, and not just on the photos but in reality too, as the watch is actually smaller than it seems; it’s not another oversized monster, even with the case diameter of 43mm. Now, that we started talking about the dial it’s a whole other topic. First of all, the movement of the watch was designed and created by Rexhep and his friends also based in Geneva, the hometown of AkriviA. 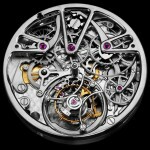 What is interesting about it is the combination of an in-house tourbillon escapement (that features letter A as the design) and the mono-pusher chronograph. 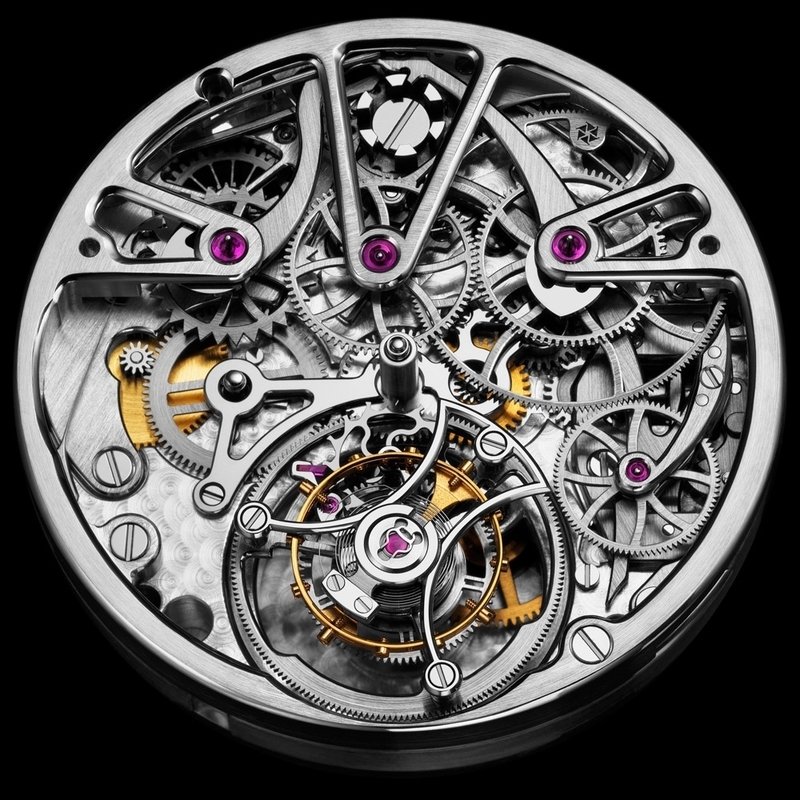 Monopushers, movements where the chronograph function is activated, stopped and reset all by pressing one button is also very rarely displayed on the ‘dial’ side of the watch, and usually are hidden contrary to this model. 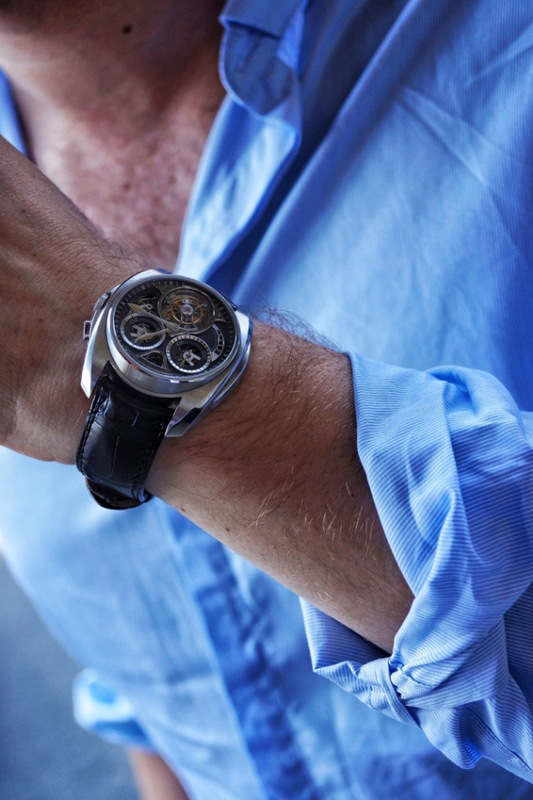 This makes the watch look very cool when the chronograph is used, as you can really see the mechanism working and even interacting with the tourbillon cage! 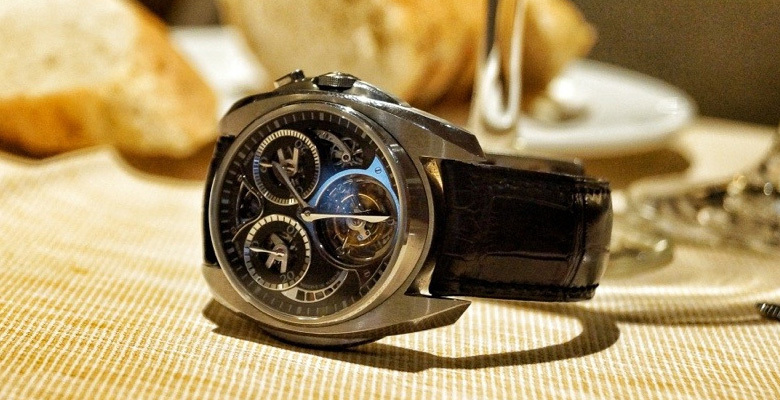 The tourbillon (what I find most impressive about this watch) is done in titanium and steel, weighing only 0.45 grams, and doing 60 second rotations, replacing the main seconds hand. I actually really like that idea because the chronograph second now doesn’t have to be that gigantic hand floating in the big dial, and can easily be offset, without being mixed for the regular seconds. 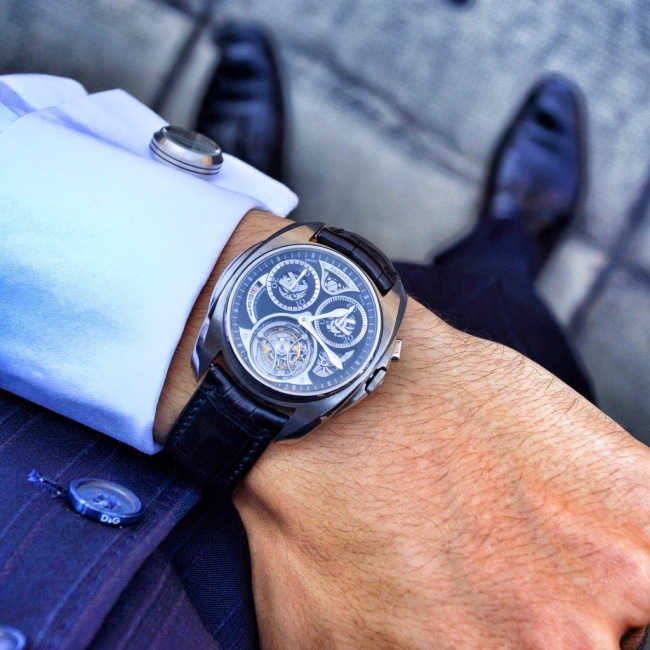 The minutes of the chrono are located at 2 o’clock in another subdial, counting every30 minutes. And whenever the pusher is activated you can see the movement work at 12 and 4 o’clock, which are skeletonized parts of the black PVD-coated dial. 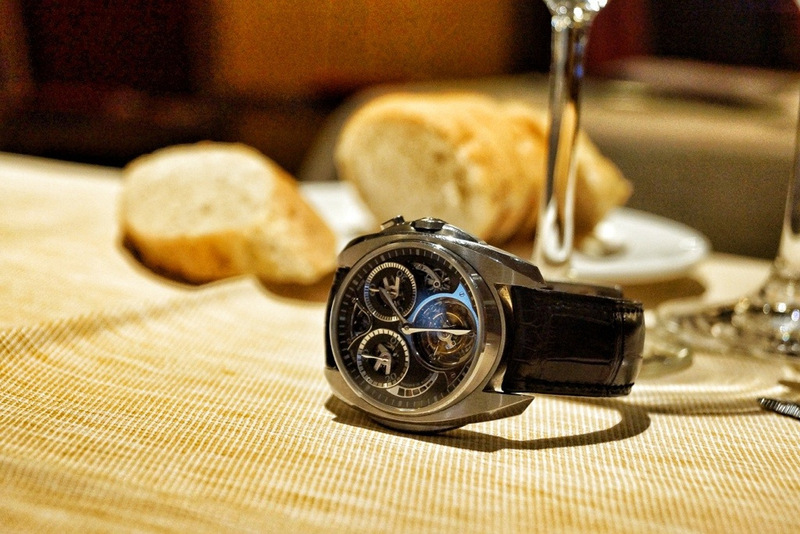 At 9 you can see the power reserve indicator of the watch, which is said to be working for 100 hours, making the chronograph function last for 72 hours. 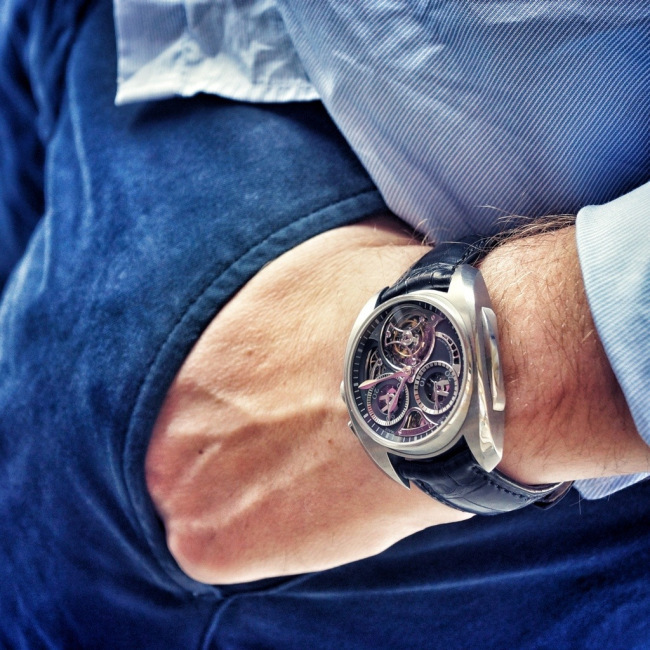 The watch ends up being classy and at the same time functional, though to be honest I’m only a fan of skeleton chronographs because I can see the movement at work, otherwise I don’t see the chrono function be very needed in a daily life, unless you’re an athlete (but why would an athlete buy a tourbillon, leather strap watch?). That fact aside the watch is awesome, and very comfortable on the wrist. Back of the watch for me is a bit less impressive, though it features my favorite types of finishing – the Cote De Geneve, and also shows pats of the manual-wind movement. On the lower part of the backside we can also see a hand-engraved name of the brand, and next to it the number of the watch (that the buyer can request). Until now the model existed only in stainless steel, but after this year’s Salon QP (November 7-9) AkriviA presented an 18K rose gold version, that is to me much more appealing and classy, though for some gold is too much and they’d prefer the original version. 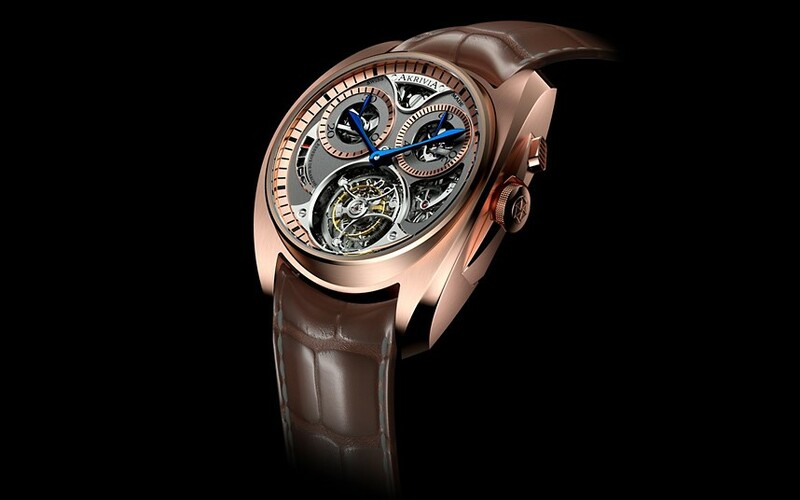 The steel model, though still in production, is going to be a limited edition of 10 pieces, for a price of CHF 160’000 and the red gold version’s price is still to be announced, but is estimated to be somewhere in the lower 200s. Yes, I totally get what you’re thinking now – the price is high, but truth be told, every product has its target customer. 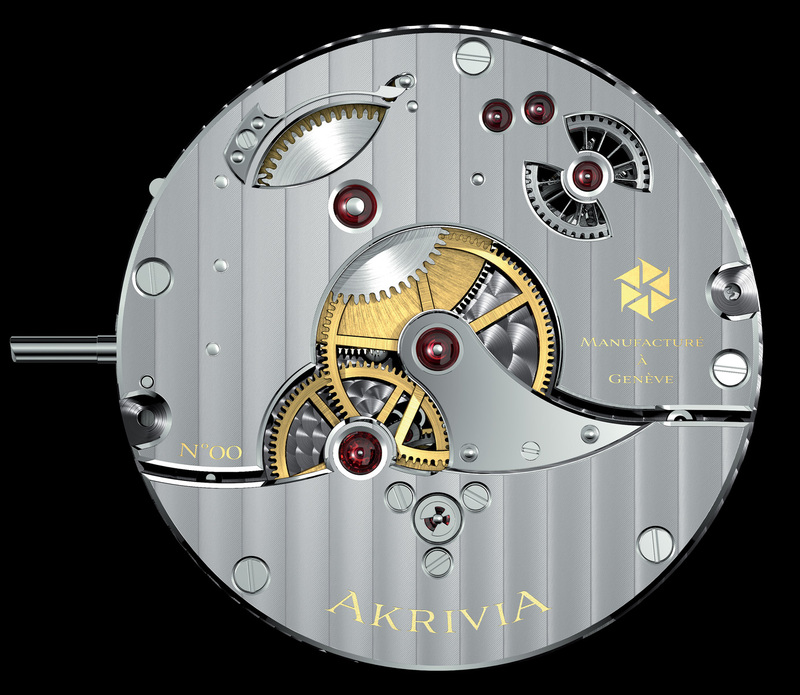 AkriviA isn’t overly ambitious, they would only make 10 of these watches, and for a small company like them it costs much more to make an in-house watch than for bigger manufacturers. So in a way I can understand the pricing strategy. Thank You all for reading my review of the Akrivia Tourbillon Monopusher Chronograph and I hope you’ve enjoyed it, and liked the watch too. It would be really interesting to know what you think about it in the comments! 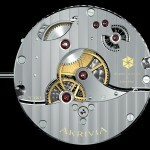 More resources about the AkriviA Tourbillon available on the Luxurious Magazine and Official AkriviA Website.